A Parrot that COOKS! Sure! I love to help Marcia in the kitchen! I've learned to taste all kinds of yummy foods while helping. (I do need constant supervision when I'm helping and I'm never allowed to go near the oven, the stove, or any sharp utensils.) I work best with the assembly and cold food prep! Watch the video of Marcia and me making a salad for dinner. I am pleased to present to you my favorite recipes. 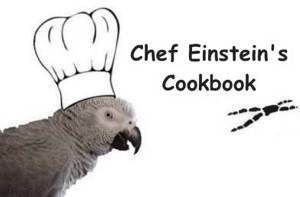 Each of these recipes can be printed or downloaded to compile your very own "Einstein's Cookbook." Don't miss Einstein's Food List on the "Eat Your Corn" page where parrot nutrition is discussed in detail. All of these recipes are just a guide. You may use what is available to you locally. Just keep in mind “Good Nutrition.” You will not see much of sunflower seed or safflower seed in my recipes, only because those are used as positive reinforcement rewards. If possible, buy and use organics. I shop at Whole Foods and LOVE the bulk bin section where I buy most all the beans and grains. FYI, I’m an “eyeball” cook. I just eyeball measurements generally, but these are pretty close. Don’t let this recipe scare you. It is more of a method and a process than a recipe. I’ve made this several time, and it never comes out the same twice because I’m always using different combinations of ingredients. It’s always good! If your parrot is not used to a mash diet, it may not recognize it as food and you may have to introduce it slowly. Give your bird time to get used to the new foods and textures. They may or may not respond to it first. As with any diet change, keep records of your bird’s weight and check with your vet. Online Sources: I buy online from Avian Organics and Avian Naturals. They are I think quality organic sources, and in the long run these companies save me time and money for products I can’t obtain locally. I have provided links to their ingredients in the recipes. I also enjoy the bread mixes from Avian Organics. They are quick and easy to prepare and have been enjoying them for a noon time snack! Pellets: Yes, pellets are still offered (on the side). They are rarely eaten, and when they are, it is usually at night right before retiring for the evening. This way of feeding has been a process, and it is still evolving, as I read and learn more about parrot nutrition. It may look intimidating, but I suggest you start slow and just try one thing at a time. I spend about 2 days, every 90 days in the kitchen preparing parrot food. I don’t know how much money I spend because I have never purchased all these ingredients at once. (Purchasing in the bulk bin section of the store helps a lot because you only buy what you need.) But, I know it is worth it. More of my fun kitchen activities can be seen on my Chef Einstein page.